The New York Times bestselling author of Armed Madhouse offers a globetrotting, Sam Spade-style investigation that blows the lid off the oil industry, the banking industry, and the governmental agencies that aren't regulating either. 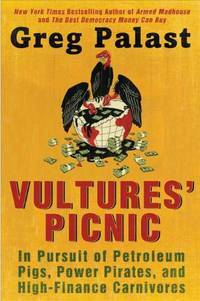 This is the story of the corporate vultures that feed on the weak and ruin our planet in the process-a story that spans the globe and decades. For Vultures' Picnic , investigative journalist Greg Palast has spent his career uncovering the connection between the world of energy (read: oil) and finance. He's built a team that reads like a casting call for a Hollywood thriller-a Swiss multilingual investigator, a punk journalist, and a gonzo cameraman-to reveal how environmental disasters like the Gulf oil spill, the Exxon Valdez, and lesser-known tragedies such as Tatitlek and Torrey Canyon are caused by corporate corruption, failed legislation, and, most interestingly, veiled connections between the financial industry and energy titans. Palast shows how the International Monetary Fund, World Bank, World Trade Organization, and Central Banks act as puppets for Big Oil. With Palast at the center of an investigation that takes us from the Arctic to Africa to the Amazon, Vultures' Picnic shows how the big powers in the money and oil game slip the bonds of regulation over and over again, and simply destroy the rules that they themselves can't write-and take advantage of nations and everyday people in the process. Dutton Adult. Hardcover. 0525952071 Item in good condition. Textbooks may not include supplemental items i.e. CDs, access codes etc... . Good. Penguin Publishing Group, 2011. Hardcover. Good. Disclaimer:A copy that has been read, but remains in clean condition. All pages are intact, and the cover is intact. The spine may show signs of wear. Pages can include limited notes and highlighting, and the copy can include previous owner inscriptions. At ThriftBooks, our motto is: Read More, Spend Less.Dust jacket quality is not guaranteed. Penguin Publishing Group, 2011. Hardcover. Very Good. Disclaimer:A copy that has been read, but remains in excellent condition. Pages are intact and are not marred by notes or highlighting, but may contain a neat previous owner name. The spine remains undamaged. At ThriftBooks, our motto is: Read More, Spend Less.Dust jacket quality is not guaranteed. Dutton Adult. Used - Good. Former Library book. Shows some signs of wear, and may have some markings on the inside. Dutton Adult. Hardcover. 0525952071 Very Good Condition - May show some limited signs of wear and may have a remainder mark. Pages and dust cover are intact and not marred by notes or highlighting. . Very Good. 2011-11-14. 1st. Dutton Adult. Hardcover. 0525952071 Has some shelf wear, highlighting, underlining and/or writing. Great used condition. A portion of your purchase of this book will be donated to non-profit organizations. Over 1,000,000 satisfied customers since 1997! We ship daily M-F. Choose expedited shipping (if available) for much faster delivery. Delivery confirmation on all US orders. . Very Good. 2011-11-14. Dutton Books, 2011-11-14. Hardcover. New. GREAT Bargain Book Deal - some may have small remainder mark - Ships out by NEXT Business Day - 100% Satisfaction Guarantee! Dutton Adult, 11/14/2011. First Edition. Hardcover. Good. Very good condition first edition book, but missing dust jacket. Full number line. Dutton Adult. Used - Very Good. Very Good condition. Very Good dust jacket. New York, NY: Dutton Books, 2011. Hard cover. Fine in very good dust jacket. DJ in Near Fine condition. Sewn binding. Cloth over boards. 432 p. Contains: Illustrations. Audience: General/trade. Dutton Adult. Very Good+ in Very Good+ dust jacket. 2011. First Edition; First Printing. Hardcover. 0525952071 . 9.20 X 6.10 X 1.30 inches . Dutton Adult. Hardcover. 0525952071 Hardcover with Dust Jacket. Good. Light to moderate shelf wear to covers/corners; satisfaction guaranteed. 1st/1st, First Edition, First Printing with full number line. Earthlight Books is a family owned and operated, independent bookstore serving Walla Walla, Washington since 1973. . Good. Dutton Adult. Hardcover. 0525952071 Ships promptly from Texas. . New. 2011. Dutton Adult. Hardcover. 0525952071 Ships from Tennessee, usually the same or next day. . New. 2011. Dutton, 2011. light wear clean copy-------------in pursuit of petroleum pigs, power pirates, and high finance carnivores. 1st PRINTING. Hard Cover. Very Good/Very Good. 8vo - over 7¾" - 9¾" tall. Dutton Adult, 2011. Complete Numbers Starting with 1. Hardcover. Fine/Fine. NOT an ex library book. Clean interior pages. Dust jacket has no chips or tears, price is not clipped.